If Modest Money is about living modestly with your money, what is the exact opposite? The exact place every reader of financial advice doesn’t want to be: living a life of Immodest Money. I’m not speaking of the politician or big boss spending money on personal “improprieties.” (Although that person certainly could use some help). What we’re talking about here is personal integrity to ourselves. What leads to a person living an immodest live? Lack of integrity, consistency, and values to the core. What leads to a person spending immodest money? Exactly the same thing. 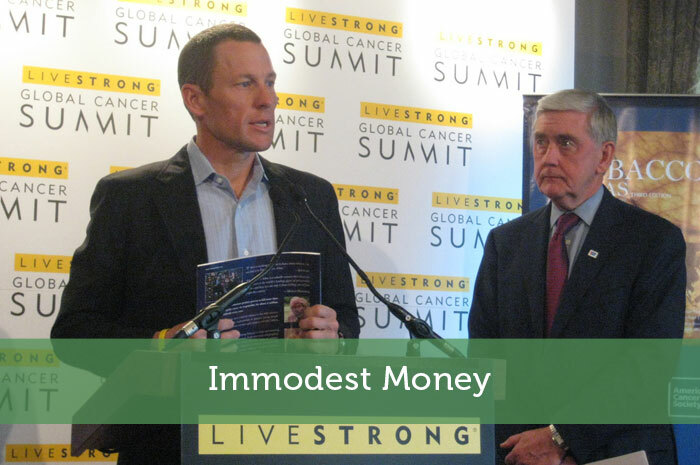 What is Immodest Money? Spending above your means. Spending in ways that aren’t true to yourself. Spending that isn’t going to get you to the modest goals you’re aiming for. What filled your mind’s eye when I mentioned the improprietous politician? You may have pictured a lusty balding white guy hanging out with younger women on a street corner. That archetype is based on people portrayed in the news that have the power and money to live on impulse. Do you live on impulse? Maybe you’re not buying the “bad” stuff and living a seedy life in an alleyway. But are you sowing bad seeds with your money? Or are you making it grow? Living and spending on impulse turns into a person spending immodest money. Rather than being reserved and thoughtful with what and how we spend, we pull the trigger quickly on stuff we don’t need, or spending beyond our means. An immodest person doesn’t have an aim or vision for themselves. Neither does a person spending immodestly. If you have money, you can spend it modestly or immodestly. But you’ll rarely live a life of frugality on accident. It happens on purpose-when you have goals. Do you have open eyes that aren’t afraid to look at bills? Immodest money is spent because we’re too fearful to really see what our current situation is. If you’re growing further in debt, or at the least not advancing towards a bigger and brighter financial future, it’s probably not because you don’t have smarts. It may be because you don’t allow yourself to take a good hard look and recognize where you’re at. Sometimes people spend immodestly because they’re lacking in some other area in life. Maybe it’s too much spending going out on the weekends. Is it to impress people? Or fill a hole with comfort food or liquid confidence? Maybe bigger and better possessions foster a greater feeling of identity. A person can spend immodestly (that is, overspend) if they’re stuck in the rat race and feel like they must beat the Joneses. How Now Shall I Live?? What motivates your spending impulses and desires? You have some sort of financial map. Maybe it’s tucked away covered in dust and coffee stains. Maybe the map has nearly zero detail. But you’ve got one. Pull it out and fill in the blanks one step at a time. Eyes sore from looking at gouging bills? Don’t turn away. Look at what’s going out, and know what’s coming in (income!). Match up those numbers and look at your excess each month. What’s the wisest thing to do with excess? That’s where the principles of Modest Money come into play. What about you? How do you suggest people make the translation from Immodest to Modest Money? Great post, Todd. For us, it was figuring out what void we were trying to fill, and then learning the right way to fill that void instead of with money or spending. At that point, money no longer had a hold over us, and was put in its proper perspective: a tool that could be used to gain financial security. That’s a great philosophy to take towards money–it’s not really something to tackle or be tackled by. But a tool to use for health, life, and helping others. I think the problem that most people have is that they try and live the lifestyle of their friends. They see their friends buying nice things and they want them too. With a little education and planning that trend can be reversed. I certainly feel what you’re saying here! I live in San Diego, and although people here are generally happy, they are definitely hurting to keep up with the Joneses. My father taught me money was emotional and he was right. I see so many people use money to fill voids and to satisfy whatever emotion is driving them to spend. It’s hard to make smart choices when you’re emotions are driving your spending habits, rather than your goals. That’s a great principle he invested in you Shannon! I recently did some copywriting for a “tri-millionaire” friend who owns a contingent workforce company. The guys not filthy rich, but he does have money. I love his perspective on it. That it simple is money. That’s all it is. 10 years ago he didn’t have it. Right now it’s just passing through his hands. He gives a lot to non-profits as a business, and individually to his church. To him it’s a tool. Thanks Cat 🙂 Glad you saw the humor within the title. Very accurate choice of picture at the top, especially given Nike’s dropped Livestrong contract! Great points. Lance’s thing is so sad. I hope that people still find meaning behind him defeating cancer and helping others as well. You can never fill a void with things. I tried. Making real changes to put your life where you want it to be is the only way. Otherwise you end up with a bunch of stuff and lots of debt. You’re right! That debt cycle, or debt loop, can be debilitating for people. I think you nailed it when you said people turn a blind eye. Immodest Money to me is spending without a plan and dealing with the consequences afterwards. That’s a great way to describe immodest or frivolous spending CBB! Time and again people contact us asking for advice about their debt problems. In 99% of cases folks wouldn’t be in such a bad position if they had acknowledged their debt. The urge to hide from our own problems is strong. Facing them is the first step on the path to being debt free – and remaining debt free. Wow that’s interesting insight–that people wouldn’t get so stuck into debt had they acknowledged that. Have you heard of any tracking or studies on the subject? No studies as such, but plenty of anecdotal evidence from AKPK, a government funded debt crisis group here in Malaysia. We now have some very active personal finance education programmes in the Malay community. Yeah? What a coincidence. Glad to hear! Yeah, I feel ya Evan!